A vibrant Kildare side put a tough week behind them with a ravenous mauling of Fermanagh in Newbridge. After the late, late horror in Celtic Park and a rare mis-step at underage level by the under-21’s on Wednesday, the early season optimism was under severe threat coming in to this one. 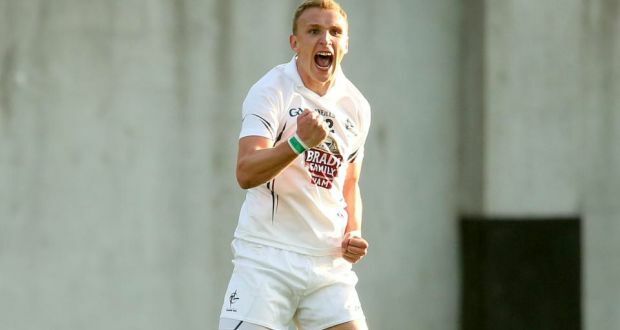 Kildare, though, are starting to develop a new identity under Cian O’Neill and it’s a promising one for supporters who have suffered so many humiliations in recent years. Today they were irresistible at times, playing the game at a pace that the Erne men were unable to match, with a fluidity of movement that made it hard at times to distinguish between backs and forwards, and impressively slick passing by foot or hand that bamboozled the visitors. They opened slugglishly though and Fermanagh got to the pitch of it so much quicker. While the Ulster side seemed determined to involve most of their players in each meandering attack, they penetrated easily enough when they put their mind to it and shot into a 0-4 to 0-1 lead within 11 minutes. Corner forward Barry Mulrone coolly notched two points after an early Tomas Corrigan free and Ryan Jones grabbed their fourth after Daniel Flynn had put Kildare on the scoreboard on 9 minutes. Flynn’s surge through the Fermanagh backs at pace was at least a sign that the home side had woken up though and the Johnstownbridge man’s pace was a danger to the men in green all afternoon. Neil Flynn had the gap down to two with a free before Kildare hit the lead, somewhat against the run of play, with a goal on 13 minutes. It was a marvellous, fluid, passing movement as the ball was slickly transferred between Niall Kelly, Paul Cribbin, Daniel Flynn and Fergal Conway with Tommy Moolick finishing it off by palming the ball home. 1-2 to 0-4. Kildare had settled now and their best period followed in the next 10 minutes. Although Jones put Fermanagh level, the influential Kevin Feely seemed to be intent on setting up another goal before sensibly taking his point. With the pace noticeably lifted and Kildare punching frequent holes in a disappointing Fermanagh rearguard, points followed for Chris Healy and Neil Flynn before a second Moolick goal put clear daylight between them. It owed much to the workrate of Cribbin who retained possession in the face of some robust challenges on the left wing. Mick O’Grady’s appearance in the attacking third was indicative of the territorial advantage Kildare held, although Fermanagh play the proverbial “lone striker” in Sean Quigley and this tends to invite teams on to them. O’Grady isn’t renowned as a point scorer and his attempt dropped short into the goalmouth where the Duracell bunny himself – Moolick – was able to get a touch and direct it past Christopher Snow. Niall Kelly, intelligent and probing as ever without reaching his very best form, popped over another point to emphasise Kildare’s superiority. Kildare then won a close range free and the home side were hugely grateful for the absence of cameras in Derry last week as young inside forwards Neil Flynn and Chris Healy reprised their quick free kick routine with the same end result – Healy finding the net. This time it was a low drive that had Snow beaten all ends up. We’re not used to such ingenuity from Kildare forwards. Long may it continue. With a ten point lead now, Kildare went back into their shell somewhat, a worrying trait we’ve seen in each of their four games although Daniel Flynn might have added a fourth goal when a toe-poke went wide after a mis-cued ’45 from his namesake Neil. By half-time Fermanagh had tacked on four points with Kildare failing to score in the last 17 minutes of the half, including injury time. Feely’s retirement with injury just before the visitors’ scoring spree was a concern. The Athy man took a knock to the calf. It could have been worse only for Mark Donnellan tipping over a goalbound effort from Aidan Breen when a high ball caught out the otherwise solid backline. Donnellan was solid all afternoon with no obvious ill-effects of his mistake in Derry. Although they’d played against the wind, you felt from prior experience that a slow start to the second half could still be the undoing of the home team. We needn’t have worried though. Kildare obviously learned their lesson from Celtic Park and re-asserted their grip. Neil Flynn pointed a free on the left to ease them back into the groove and the excellent replacement for Feely, Fionn Dowling, stretched the lead back to eight points from long range before the lively Neil Flynn made it three points in three minutes for Kildare. The game was sealed to all intents and purposes on 41 minutes when Fermanagh incredibly were suckered by another quick free. Healy, such an impressive addition to the forward line these last two weeks, was the creator this time, spotting a run from Daniel Flynn and the full forward side-stepped Snow to drill a fourth goal home for the Lilies. 4-9 to 0-9 now. Fermanagh were game and battled away without ever really threatening the goal they badly needed. O’Neill meanwhile emptied the Kildare bench. Cribbin and Conway scored magnificent long range points from either side – fitting reward for their endeavours. Conway was a strong contender for man-of-the-match along with the powerful Eoin Doyle at centre back. The 47th minute encapsulated Conway’s endeavour and spirit. In his own wing-back position he twice thwarted Fermanagh attacks before launching a forward move. Lo and behold it was he who was on hand at the end of it with a point attempt. Substitutes Eddie Heavey and Conor Hartley joined Dowling on the scoresheet before the game was out as Kildare ran out deserved 12 point winners. And so Kildare continue to over-achieve on expectations coming into this league. Six points from eight see them top of Division Two but with nothing guaranteed in a topsy-turvy division. Down’s resurgence paints the St.Patrick’s week end fixture in Newry in a very different light. However Kildare are playing with a verve we haven’t seen for years. A system of play seems to be emerging, with Doyle holding the fort superbly at centre back while the rest of the backline are free to inject pace and thrust into the attack. Feely and Moolick are more than breaking even at midfield and the forward line continues to put up impressive scores. Fermanagh just couldn’t cope with the pace and variety of the Lilywhite attacks. We can’t get carried away, as the Erne Men were the most limited opponents we have faced so far, but you have to enjoy days like today. To put in context, the last time we scored four in a league game was in the Quarter Final 17 years ago when losing to Cork. Kildare’s +27 scoring difference is the best in the top two Divisions and second only to Division 3 Armagh nationwide after their pummeling of Offaly today. Stat Attack 1: Tommy Moolick has now scored 7 League and Championship goals for Kildare in 39 appearances. Stat Attack 2: 11 different players scored for Kildare – both midfielders, all six forwards and three subs. That’s the best spread of scores since 12 made the scoresheet in the qualifier win over Longford in 2015. Mark Donnellan; Mick O’Grady, David Hyland, Ollie Lyons; Johnny Byrne, Eoin Doyle, Keith Cribbin; Kevin Feely (0-1), Tommy Moolick (2-0); Fergal Conway (0-1), Niall Kelly (0-1), Paul Cribbin (0-1); Neil Flynn (2f) 0-4, Daniel Flynn 1-1, Chris Healy 1-1. Subs: Fionn Dowling (0-2, for Feely 31), Cathal McNally (for D.Flynn 53), Eddie Heavey (0-1, for P.Cribbin 60), Conor Hartley (0-1, for N.Kelly 61), Eamon Callaghan (for N.Flynn 63), Peter Kelly (for Byrne 63).